A clean guide to purchasing the perfect commercial dishwasher! Before you purchase a commercial dishwasher let Kinnek do the hard part. Submit a free request for quotes and we'll get multiple manufacturers to provide you with offerings and pricing for whatever your supply needs - all in one place! High grade dishwashers are a ubiquitous piece of equipment in commercial kitchens. Choosing an appropriate dishwasher for your kitchen’s needs is central to the running of a clean, restaurant-quality kitchen, and will undoubtedly have an effect on public perception of your business. Restaurants with dishwashers that are unsuited for the tasks-at-hand may risk upsetting customers with crusted glassware, dishware, and utensils, and may risk health inspection failure, which could threaten the very life of your business. Before engaging with suppliers, make sure to weigh the specific cleaning needs of your commercial kitchen with available dishwasher offerings. There are a number of factors to take into account when considering the purchase of a commercial dishwasher for your business: labor requirements, floor space, dishwashing capacity, initial cost and maintenance costs, and effectiveness. These factors are frequently linked together. For example, a high capacity commercial dishwasher will usually be physically larger than a lower capacity dishwasher (and thus will take up more floor space), and will usually cost more (both initially and for maintenance over time) than a lower capacity dishwasher. Many higher-end, high capacity dishwashers are also more efficient in terms of energy and water use, which may be important to you. As a general strategy, we recommend that you list your priorities prior to contacting suppliers so that they match their offerings to your needs. Some commercial dishwashers come with pre-rinser mechanisms that reduce or even eliminate the need for someone to pre-rinse the dish before placing it in the wash. Alternatively, if you want to alleviate the time and labor cost spent on rinsing, look into purchasing a pre-rinse unit. Your employees can use a pre-rinse unit to easily spray away any food residue before placing the dish in the wash. 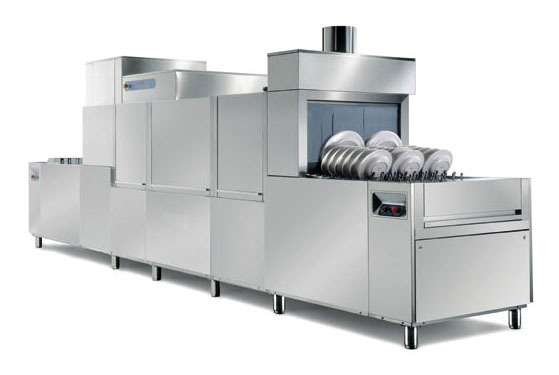 Most commercial dishwasher types come in high temperature and low temperature models. For a complete clean, both models require detergents and various cleaning agents, but high temperature models primarily clean dishes by heating the wash water to an intense enough heat for sanitization to occur, whereas low temperature models require the use of additional chemical agents for complete sanitization. There are advantages and disadvantages to each. Operating cost is generally less than equivalent low temperature machines (fewer wash cycles, less water used per cycle, shorter wash cycles, and larger rack capacity). High temperature machines are generally more efficient, which gives them a slight edge in particularly busy kitchens. High temperature machines are somewhat more adept at removing grease, heavy oils, and other very-resistant residues. Initial cost is significantly more than equivalent low temperature machines, and this initial investment can increase further if a booster heater does not come pre-installed. Initial cost is significantly less than equivalent high temperature machines. Chemical agents can be damaging to certain types of dishware and metals (before purchasing a low temperature dishwasher, make sure that your dishware is compatible with the chemical agents that you’ll be using with your dishwasher). Greater operating costs than equivalent high temperature machines (frequent rewash cycles may be necessary for tough residue and grease, longer wash cycles, lower rack capacity, more water used per cycle, and additional costs for chemical agents). Your choice of a dishwasher will depend on a number of factors: space requirements, turn rates, cost, and the type of dishware that you’ll be using. For example, if you operate a bar or a club, or if your restaurant has a sizable bar area, you may find it necessary to purchase a separate glasswasher, which will enable you to safely and quickly clean glassware (which has a very high turn rate in a bar setting) independent of existing mixed dishware machines. The specific needs of you're establishment should determine the type of dishwasher you consider for purchase. If space permits, door type machines can handle significantly more dishes than undercounter units. A wide variety are available on offer from suppliers, with some models featuring rack capacities similar to undercounter dishwashers, and others going up to as much as 90 or even 100 racks per hour. Door type dishwashers are usually used with accessory dishtables to provide a streamlined loading/unloading operation. Door type dishwashers are often fitted up in the corner of a kitchen to save space, though the design of your dishwasher may limit its placement, so confirm with your supplier whether the dishwasher is suitable for the desired placement. There are single and double rack options, with a standard dishwasher rack being 20" x 20". Straight configurations pass dish racks from front to back. Corner configurations pass dish racks from front to side. Conveyor dishwashers are found in very large restaurants, but more frequently in cafeterias, banquet halls, and other establishments with a massive dishware turn rate. Conveyor dishwasher capacity can reach upwards of 450 racks per hour. Conveyor width and interior clearance are important factors when puchasing a conveyor dishwasher as they determine what will be able to fit through the unit. Flight dishwashers use conveyor belts instead of wash racks. The dishes are placed on the conveyor belt and feed sequentially into the machine for washing. These dishwasher machines represent the highest capacity in the industry. They are capable of washing thousands to tens of thousands of dishes per hour. The expense, capacity, labor, and floor space requirements generally limit purchasers to hospitals, banquet halls, schools/colleges, and other large food providers. Pot and Pan Washers are frequently found in bakeries, but may also be seen in restaurants with starchy, caked-on foods or with a high turnover of thick pots and pans (which may be more difficult to clean, or may not physically fit into an existing dishwasher machine). Pot and Pan washers utilize high pressure water to blast difficult-to-remove residue off of commercial cookware and utensils. A pot and pan washer can save a great deal in labor costs and inefficiency as it introduces automatic cleaning to cookware that is usually cleaned manually. Glasswashers are the functional opposite of Pot and Pan Washers – instead of spraying high-pressure water, glasswasher machines spray low-pressure water to safely clean large amounts of glassware while minimizing breakage. Glasswashers are best for bars, clubs, and any restaurant with a sizable bar service. A glass washer machine can turn over from several hundred to several thousand glasses per hour.